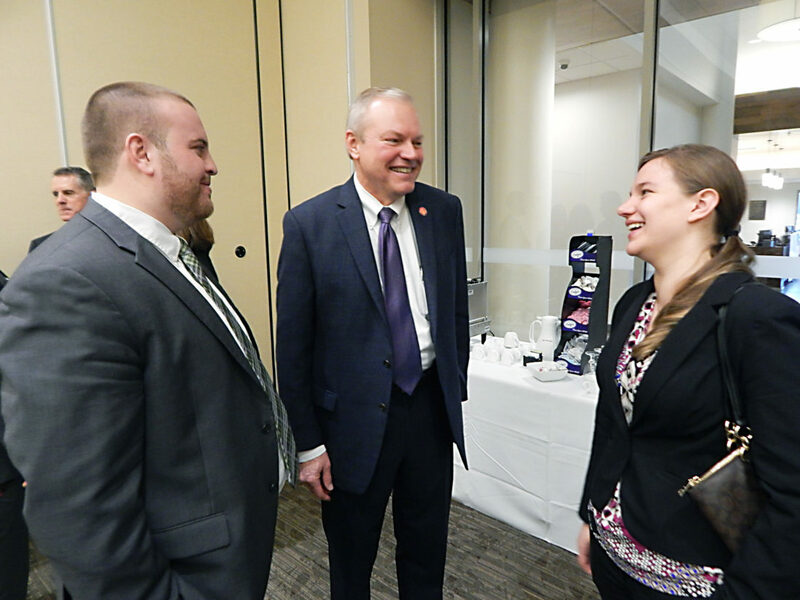 PHOTO BY JIMMY FLINT Bryce Riggs (left) and Katie Lang (right), of Seneca Industrial and Economic Development Corp., speak with 88th District State Rep. Bill Reineke, R-Tiffin, after a news conference at Terra State Community College in Fremont Thursday morning. Local leaders and government officials learned Thursday morning the state capital budget is likely to bring nearly $2 million for projects in Seneca County, including about $350,000 for a park and museums. During a news conference at Terra State Community College, 88th District State Rep. Bill Reineke, R-Tiffin, said the capital budget bill was introduced this week in the state House and Senate. He said a budget priority was to combat the opioid epidemic. It was addressed, in part, by supporting parks and the arts to give people quality activities as an alternative to doing drugs. Reineke said $300,000 is allocated to the East Green Complex, a park set to open this summer in downtown Tiffin. Andrew Kalnow, owner of National Machinery who has headed up the park project, said funding is earmarked to clean up utilities in an alley near the complex. He said utility lines are unsightly and the money is to be used to bury them. There also will be about $50,000 in funding available for improvements at Seneca County Museum and the American Civil War Museum of Ohio, both located in Tiffin. Reineke said a clear, concise message from local leaders and economic development professionals went a long way in securing the funding. Tiffin Mayor Aaron Montz thanked Reineke for fighting for Seneca and Sandusky counties in Columbus. Montz said Reineke is accessible and fights to bring funding back to the area. Montz said the funding will lead to an increase in the quality of life for residents. “It’s absolutely tremendous for Tiffin,” he said.